When they invaded the USSR in June 1941, the Germans made rapid and very extensive gains against Soviet forces that were poorly trained, badly led and often equipped with obsolescent if not obsolete weapons. One exception, though, was Soviet medium artillery which, as the Germans rapidly found, was technically excellent in many respects. 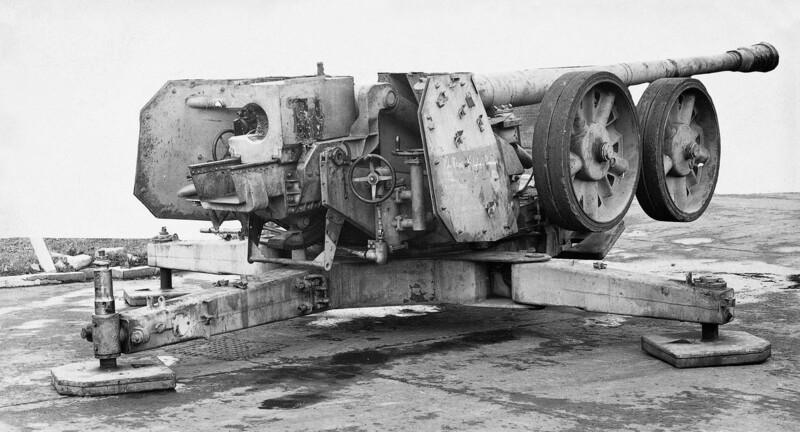 In an effort to provide the German Army with improved weapons in the 128mm calibre, Krupp created the 12.8cm Kanone 43 as a structurally light gun with a screw breech rather than the usual sliding block, but this found no favour, for better 12.8cm K 44 (sometimes 12.8cm PaK 44) weapons were offered by Rheinmetall-Borsig as well as Krupp as field guns with a potent anti-tank capability on a carriage offering 360° traverse. The two guns were generally similar in performance, but the Krupp weapon was preferred as its four-wheel carriage offered production advantages over the more complicated six-wheel carriage of the Rheinmetall weapon. Production of the K 44 never rose above a trickle as a result of production problems, however, and at the end of World War II the German Army had received only a few of these impressive weapons. A version of the K 44 for installation in armoured vehicles was the 12.8cm KwK 82, which was installed in the Jagdtiger tank destroyer.